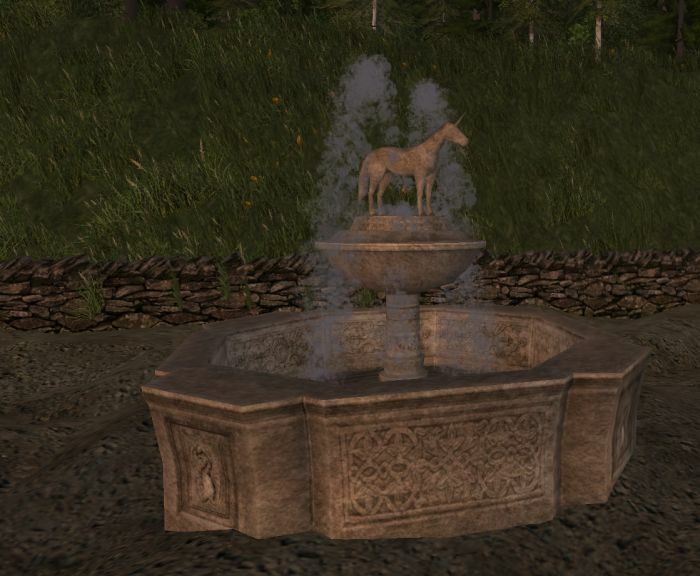 New Fountains and Other Goodies #WurmOnline – Nomadic Gamers, eh! We got some brand new fountain graphics last week, with actual moving water. There are two designs, this one and one that is mostly a tier of bowls upon one another. Same sleek design and same actual spouting water graphic. It’s pretty but there have also been some reports of it slowing down FPS, so if you’re having issues you may want to enable frame limits of 30. Last week added a lot of unintended bugs, most of them seem to have been ironed out by now thankfully. I have been working diligently on my three deeds. First there’s Les Reveur. This is a very neglected mountain top deed. There’s a trader, and a lot of silver veins. The deed has only two horses and no fields or other animals as it’s more of a pit-stop for when I go exploring or mining. My character Faralithe owns this deed, and I’ve been paying for her account with in-game silver rather than cash. If for some reason I don’t have the in-game silver, I leave her as a freemium. I also own Mystic Cove, which is a coastal deed south of Les. I’ve decided not to breed so many animals there so I bashed down an entire center area that used to be pens. I’ve decided I’d like a hedge maze there, in the center an area with the fountain posted above. Each hedge uses 5 sprouts of the same type, and I haven’t been out collecting them yet but soon. I am not sure if I want to design the maze first on paper or just wing it. I suppose we’ll see! Mystic Cove also has a trader. Finally I own Le Cirque des Reves which is in between the two deeds. Another trader (I know, I own three, that’s probably far too many) is there, and it’s a mountain top deed. There’s a large area for breeding horses, and two enormous fields plus a gigantic mine and a number of buildings. I also created a little garden with some benches and statues, lined by maple trees. My Vynora priest stays there since the deed is completed and is perfect for her to work her skills up at. I am thinking I may eventually turn one of the fields into an area for grapes, for wine making. This weekend I set up a second merchant in a Northern marketplace. So far I haven’t gotten any sales yet, but maybe with time. Sales on Deliverance in general are a bit slow. Hi! I’ve been reading your blog for quite some while now, and it’s always enjoyable – thank you for your notes from the digital field! I think I mentioned in a comment some months ago that I used to live in the area just north of Les Reveur (back in September-December 2011), which you said had been deeded by Zen and was now called The Overlook. I would still be very curious to see some screenshots of the area, now that it’s been over a year since I quit Wurm. Seeing how places decay and are renewed by players are one of my favorite things about sandbox games like Wurm, especially places I spent a few months of my life improving and calling home.